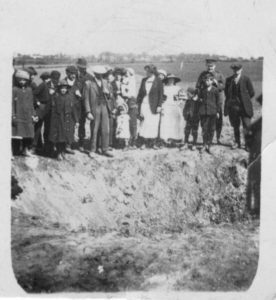 During a zeppelin raid on 30th April 1915 a bomb was dropped at Woolpit Warren / Warren Lane. Thomas Manning (2nd from right, in uniform) can be seen with his son William; other folk not yet identified). Bill Farrow also witnessed this event. The German airship passed over the parishes of Elmswell and Woolpit during the early hours of Friday morning, and it dropped a bomb in a field on the boundary of the two parishes. The bomb made a hole in the ground some twenty feet in diameter, and between nine and ten feet in depth. Fragments of the explosive were picked up three hundred yards away from the spot where the explosion took place. It was a merciful escape from sudden death – for, if the bomb had fallen two hundred yards to the north it must have caused considerable havoc amongst the houses in Elmswell. B ut, thank God, it fell in a ploughed field and injured no-one. The noise of the explosion was terrific, and the windows of the houses in the vicinity vibrated for upwards of half a minute after the occurrence. The congregation attending Elmswell Church on Sunday night sang the Te Deum at the end of the service as an act of gratitude to Almighty God for protecting them in their hour of imminent danger.